Yeshua-Jesus delights to manifest His glorious presence to those who love Him and obey His commandments. He does so in innumerable ways throughout life, but sometimes He chooses to do something very special just so you will know that He is pleased with your obedience and your desire to go aside–leaving everything behind– just to minister unto Him. It is one such encounter that literally almost blew me away. I was in the midst of about six hundred women as I left the morning session and walked down the long sidewalk that connected the convention center to the rest of the campus buildings at Gulf Shore Baptist Assembly. It was a beautiful, clear September sky on the Mississippi Gulf Coast. As is typical for September in South Mississippi it was hot and humid, and seemed especially hot this day since there was no breeze. The campus style retreat center is located inland on a portion of the back bay. The wide sidewalk that seemed to be about the length of a football field was filled with chatting ladies two and three abreast as they walked toward the cafeteria in the main complex. This was one time that I was glad that I didn’t have anyone with me except the Lord, for as I walked toward the dormitory to get my violin, He birthed a new song in me. I began to hum along to the Jewish jig that was going off in my head. I was so glad that the LORD had not only instructed me to play before Him during the meals, but that He was also supplying the songs–new songs from His Spirit. You see, when the LORD instructed me to attend this conference and I saw that it would be during the final week of a thirty-day fast, I asked Him what He wanted me to do during meal time. I didn’t mind sitting and visiting with the other ladies during the meal and having a glass of tea. I just didn’t want to draw attention to the fact that I was not eating. He told me that I was to go aside from the others and minister to Him on my violin. So, as all the other ladies filed into the dining hall, I quickly went to my room, got my violin, and went in search of a solitude place where I could play my new song. God had already worked a miracle in getting me to this interfaith ladies conference, for in the natural, it would have been impossible. Multiple road blocks stood between me and that meeting–roadblocks especially concerning my job–that I had absolutely no control over. However, I knew that God had ordained that I be there and He had confirmed it, so I knew that HE would get me there–and He did. I stood in awe as I watched each mountain fall flat before me all the way up to the eleventh hour. I knew that it would be a very special time for me to spend in His Presence, but I had no idea of all that was waiting for me. The conference had begun the previous afternoon, and as the women were enjoying their first meal together, I took my violin and walked out to the end of the pier and began to play. I felt very self-conscious. I was not an accomplished violinist and because I did not “perform” with it, the only audience I desired was an audience of ONE–Yahweh. This was to be a very intimate and private thing between Him and me, however, I quickly realized that finding a place of solitude and privacy might prove to be quite difficult. The location was a wonderful place to have such a conference as this. I had only been there once before, about twenty years earlier when the church I attended held a youth conference of which my husband and I were counselors. Everything about the grounds seemed vaguely familiar, but not familiar enough to know where to find the quiet place I so desperately desired. As I sat there at the end of the pier playing my violin, the other women who had finished their meal began to stroll out onto the pier near me. It was very distracting, but I didn’t know where else to go. Even though the pier is fairly long and wide, I had to cease playing as more and more women appeared. It wasn’t their fault. It was just too distracting. By this time it night had fallen and I finally found an out-of-the-way spot far enough away from the others that I could play and pray more privately. The next morning, I left the dorm room early to go look for that “special” place. As I headed toward the pier I could see that some were already there. Not everyone eats breakfast you know. I didn’t know where else to go. I just knew that I wanted near the water for I sensed that was where He wanted to meet me this morning. As I reached where the grass ended and the beach of the bay began, I slipped off my shoes and with violin and bow in hand, began walking across the sand toward the water’s edge away from all the others. (The beach is in the upper left portion of the photo above. The pier is at the right end of the beach. ) It wasn’t a very long beach on that end of the bay. I walked about half way down the beach and stood with my feet in the edge of the water. I began to play quietly. I really didn’t want those on the pier to hear me. I felt self-conscious this time because I knew that those who were on the pier and those standing on the balcony of their rooms could easily see me, even if they couldn’t hear me playing. I felt like a spectacle. This was NOT what I desired. It only caused me to have to war with my mind and with my flesh. But, I was not to be denied. I pressed in. I kept playing and did all I could to shut out every thought that tried to distract me from my LORD. As I obeyed the leading of the Holy Spirit, a brand new song began to rise from the strings. It was a beautiful love song unto the Lover of My Soul. At last, I reached that glorious place–that place where it was only Him and me. After a few minutes I stopped playing and just stood there basking in His Presence. I threw my head back and lifted my face toward heaven. I raised my violin over my head with my left hand and my bow stretched upward in my right. I stood there, arms outstretched toward heaven, worshipping my Lord with complete abandon. I did not care who was watching or what they thought. My God, my Lord and King had given me audience. I played a little more and then realized it was time to head toward the conference hall for that mornings meeting. As I walked back toward my room to leave my violin and pick up my Bible, I noticed some women on one of the balconies looking toward me. I didn’t know how long they had been there, and in seeing them I began to have to war with my thoughts again. The enemy quickly began to accuse me by saying that I was doing all of this just for show–to look spiritual–blah, blah, blah. Well, regardless of his accusations, I knew in my heart that I was simply obeying my Lord. I had to remind myself, and reminded that devil, that doing this was not my idea. Yahweh had instructed me to do what I was doing. I had done all I could to find a more private place, but one was not to be found. And besides, I’m not ashamed to worship my LORD before the whole world! Amazing isn’t it how the devil plays mind games and tries to condemn you no matter what you do. If you are bold he tells you that you are full of pride and do what you do to be praised of man. If you hold back and allow your fear of man to intimidate you and you fail to be bold, the devil tells you that you have no faith and that you are a failure to God. So, throughout my walk with the LORD Yeshua (Jesus), I have learned to only listen to HIM and obey HIS voice regardless of the consequences. Each time I do this I have complete peace, absolute victory, and am filled with the joy of the LORD. The morning service was wonderful. We had spent the last two hours worshiping with absolute abandon and were filled with the Word of God from anointed speakers. And here I was, filled to overflowing, walking back toward the other buildings, humming another new song. This song was so different from this mornings or last nights songs He gave me. There was such an excitement and joy with it. I couldn’t wait to play it. I hurried and got my violin from my room. As the other women were filing into the cafeteria for lunch, I began looking for a private place to play. I was tired of being distracted and I could tell that this song was going to be jubilant and louder than the others. I was going to need a place I could have more freedom to just let loose and play without worrying if someone else would hear it. The sun was beating down and it was really hot. I found a shady spot and sat down on a slope near the end of one of the buildings. It only took a minute to realize that this was neither private nor comfortable. I got back up and began to walk around the back side of the building. (See top center of photo–the back building nearest the bay.) I saw what appeared to be a perfect spot. On the back side of the building, just outside a conference room, there was a metal picnic table. It was in the shade and not in view of or near anyone else. Shady and secluded–PERFECT! Or so I thought. Just as I laid my violin case on the table I as accosted by a swarm of mosquitoes! I had to wave them off of me, quickly shut my violin case, and get out of there. 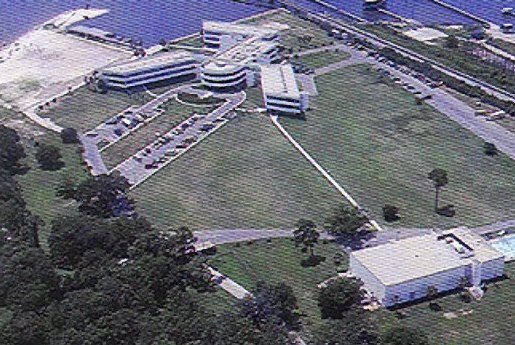 I walked on around the end of that building and began walking down the long sidewalk that crossed the grounds, past the pier and the beach, ending at the building at the front of the property. The mid-day sun was beating down on me and sweat was running down my face and neck. I noticed that several women were already finished with their meal and were milling about on the peer and all over the campus. I said, LORD, if I don’t hurry up and find a place, I’m going to run out of time before the next meeting. I just kept walking down that long sidewalk that crossed the back side of the campus and had no idea where I was going. As I neared the end of it, I noticed that it branched off and went beneath one of the buildings at the front of the campus. Here, beneath the building it was completely open to the outside and I was surprised that it was near the front parking area. There was another metal picnic table beneath it. And, though there was no breeze there either, there were no mosquitoes. I looked around and realized that I was indeed at the perfect spot. On one side was the front parking area and on the other was the vast campus grounds and the bay. No one was anywhere near me. Finally! (See the building on the left.) I stood there next to the picnic table, faced the parking lot and finally began to play the wonderful song that was still going off in my head. Even through all the hassle of trying to find a place to play, the tune never left me. I loved it! I played this Jewish jig over and over again. It was like a Jewish “River Dance”. The more I played it the less I even considered if I was being heard or not. I played it loud and fast and just got lost in the music. After several minutes of playing this song from the LORD, I stopped to rest my shoulders. I was so thankful to be under the building and out of the sun, but, because there was no air flowing, no breeze, my clothes were soaking wet with sweat. Then, with no forethought, I turned in the opposite direction and faced the bay which was at least seventy-five yards from me. And, though there was no wind blowing, not even a whisper of a breeze on this hot and humid day, I lifted my violin and bow over my head before the LORD and heard myself loudly proclaiming with great joy,“LORD! Take my music on the wings of Your wind!” As soon as I said it I knew it was from the Holy Spirit, for I had never said such a thing before. Immediately, I spun back around and began to play the song before the Lord again. Because of what the Holy Spirit had me say, I did so with great excitement and anticipation that the Lord would be pleased with my worship and would receive my song unto Himself as a sacrifice of praise. HE took my music on the wings of His Wind!